Random House Books for Young Readers, 9780375860140, 40pp. Murray the mouse likes everything to be perfect. Naturally, his perfect meal on a perfect winter day is Perfect Soup. But Murray doesn’t have a carrot, and Perfect Soup isn’t perfect without a carrot. With the snow falling around him, Murray ventures out of his little house to track down the final ingredient for his Perfect Soup. And there’s no time for playing around—Murray is in a hurry. The farmer will be happy to provide a carrot if Murray will haul some logs. The horse will gladly haul the logs for Murray if he’ll give him some fancy jingle bells in return. It looks like Murray just might get his carrot, but it only takes one grumpy person for a delicate chain of favors like this to fall apart. Can a friendly snowman help Murray make the soup perfect anyway? Author Lisa Moser and illustrator Ben Mantle have filled Murray’s little town with richly colorful winter landscapes, wonderfully detailed cozy homes, a hilarious cast of quirky characters, and the absolute cutest talking snowman you have ever seen. Parents and kids alike won’t be able to resist picking this book up again and again. Over the years, Lisa Moser has made countless snowmen and several books for children. She lives with her husband and daughter in Wisconsin, where they all enjoy soup--not perfect, by any means, but warm and lovely just the same. 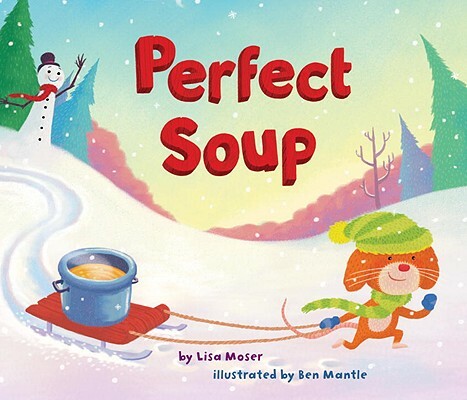 Lisa says, "I hope "Perfect Soup" inspires new friendships and rekindles old ones." Ben Mantle was born in Leamington Spa, England, and developed a very early interest in all things artistic and festive, even coming in first in his local library's coloring competition. From there he went on to study animation at the Surrey Institute of Art & Design. He then joined the crew of Tim Burton's "Corpse Bride" and now works as an illustrator and animator from his seaside base in Brighton. Ben is still perennially excited about the holidays and wishes it would snow every day of the year.